Rome wasn’t built in a day. Neither are website redesigns. In line with the piecemeal responsive Web design implementation trend we recently highlighted, the new Ed.gov website redesign happened in three phases. In this case, budget limitations and existing content management systems (CMSs) influenced the decision-making process. The redesign process began in late 2012, with an initial look at budgets and the realities of what a redesign would mean for the website. James and her colleagues in the Department’s Office of the Chief Information Officer determined that timing the redesign with technical upgrades would save money and make the best use of resources. They started with a WordPress upgrade for their flagship blog, Homeroom. The second phase was focused on upgrading TeamSite/Websphere, and a few of the smaller mini-sites of Ed.gov that were based in WordPress.The website became mobile-friendly in June 2014, when the second phase of the website redesign was finished. The third and final phase was completed at the end of January. Their homepage and online press room are based in Drupal, which was upgraded from version 6 to 7. 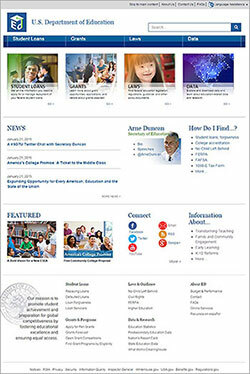 All of Ed.gov’s website and blogs now have responsive design and Bootstrap styling. The combination of responsive themes and Bootstrap means that Ed.gov pages automatically adjust to the size of smartphones or tablets. Going with this style was a pivot from their initial plans. James noted that her team had to make only a few content changes to account for changes in navigation. Although Ed.gov is based on three different platforms, James said that they have worked hard to tie the branding together in a way that is not disruptive to customers. Many customers don’t even notice they are on different parts of the site, James said.